Yackandandah is an historic country town tucked away in foothills of the Stanley State Forest in north east Victoria. It is a warm place with a well-connected community and a ‘can-do’ attitude that sees this little town punching well above its weight in making things happen. So when this little town decided they wanted a community garden, you just knew it was going to happen….somehow. In mid- 2012, SGA and the Helen Macpherson Smith Trust were 12 months from completing their Community Based Gardening Project in 2009 Bushfire areas of Victoria. Four gardens were already underway and the project was running to plan. Through good management, the project was also running significantly under budget. 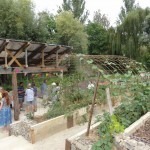 A decision was made to build another community garden if a community could be found who were ready, willing and passionate about taking this kind of project on. Building a full-size community garden from scratch is not for the faint hearted or the uncommitted. But when a community like Yackandandah puts their hands up and seizes the opportunity to fulfil a long held dream, the only way is forward. 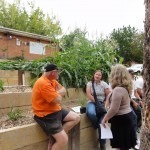 So in early 2013, Yackandandah, SGA and the Helen Macpherson Smith Trust started to work on the Yackandandah Community Garden project. In order to support the community and to be realistic about the time frames, the project closing date was extended by 6 months to 31st December 2013. A local facilitator, Lee-Anne Benson, was appointed; a working group was formed, led by the amazing people from the Yackandandah Community Education Network (YCEN) and members of the broader Yackandandah community put up their hands to be part of this wonderful opportunity for the town. 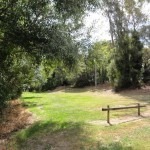 Faced with difficulties in locating a suitable site for the community garden, Indigo Shire stepped in and offered a narrow, disused section of town land, between Commissioners Creek and the Yackandandah swimming pool. It is a pretty area, close to the main street with enormous potential for a community garden. In fact the same site had been used as a market garden from the gold rush era right up to the early 20th century. The site itself presented some difficulties as it is steeply sloped on one side and the opposite side is prone to flooding when the creek is in full flow. However everyone involved felt that the risks could be lessened and managed and that the advantages of the site outweighed any difficulties it presented. Tabitha Barclay a talented garden designer and land management expert from the Toolangi & Castella Community Garden worked with the community to devise a garden plan that made practical use of the site limitations. She is pictured here with Dr. Phil Moors, HMST Trust and Judy Davis, YCEN. Terracing of garden beds was included to reduce the negative impact of the sloping sections. Naturally elevated areas on the site provided opportunities to ensure garden infrastructure, such as the equipment shed and water tanks, could be placed on these plateaus to protect them from flooding. Wide paths were included and levelling planned so that less able members of the community could be sure of walking around the entire garden. Of course, a plan’s a plan and all that, but the hard work starts when everyone gets out to build it. And this little community pulled out all the stops. 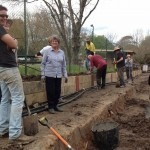 Led by some amazing community members and with great assistance from the Beechworth Correctional Centre, for months on end, this little community, scraped and dug, weeded and pulled, built and formed, planted and watered, laughed and encouraged until finally their magnificent garden was built. Through the cold and rain of winter, followed by the searing heat of the summer months, this tight knit community pulled together and completed their project. Local businesses and traders pitched in to give a helping hand; goods were donated and found items recycled. No idea was a bad idea and if you didn’t feel like you could be part of the physical work, then a pot of soup, a platter of sandwiches, a plate of cake or a hot or cold drink was always welcome. 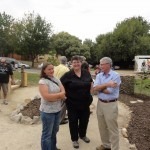 And so in March this year, the Yackandandah Community Garden was officially launched with around 100 people turning out to be part of the event, including representatives from SGA and the Helen Macpherson Smith Trust. Community members and visitors from far and wide, including Canberra and Melbourne, travelled to be part of this lovely day. After the speeches, everyone was invited to share in a magnificent afternoon tea in the garden. And the party went on well into the afternoon. Yackandandah is in Jiatmathang country, with the Aboriginal meaning of Yackandandah believed to be, “one boulder on top of another at the junction of two creeks”. The community garden included this image in the graphic used on the garden signage. The sign welcomes everyone to the community garden as they believe that this garden belongs to the whole community and not just the gardeners amongst them. If you want to be part of this community garden, you can sign up by emailing YackandandahCG@gmail.com. 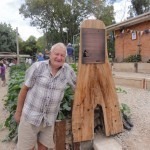 You don’t even have to be a Yackandandah resident to join; occasional visitors to the town or just about anyone who would like to support this small community with big dreams can become a garden member. Yackandandah community and gardeners, you can be proud of yourselves!